In this article I will explain about using Go to develop web application together with template and jQuery integration. Develop a web server is a trivial task in Go. Interestingly, Go which initially meant to ease the development of server software has lots of standard libraries for that purpose. Web server is not the only one, although we will explore this capability now. 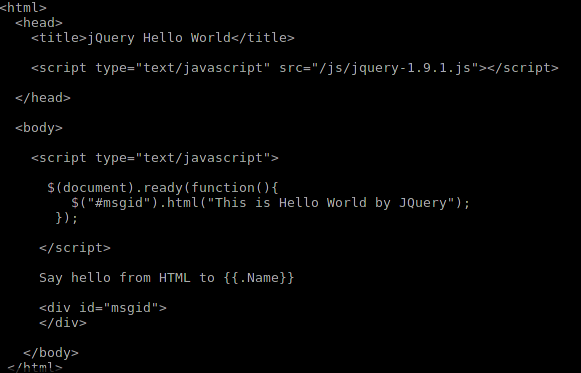 Before we continue, make sure that you already have jQuery (I use jquery-ui 1.9.1) and of course Go (1.0.3). For now, we do not need template engine since Go comes with html/template package. That's enough for now. Ok, let me give an overview first. We will develop a simple Web application. Our application (let's say its name is go-jquery-example) will read the template, put a string inside the template and display the template. Wait, that's not quite complex, we will add jQuery into that page so in the future we may develop a Web application with good UI. To this end we should make a static file explorer into our Web application so that we can place jQuery into the template (like /js/jquery-ui.js). 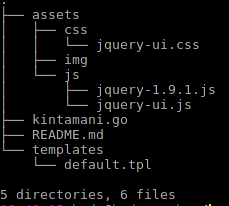 Let's see the directory structure first. templates: this directory will serve all template files. Try access http://server:8123/ and http://server:8123/display to see the result. Full source code available at https://github.com/bpdp/go-jquery-example. Enjoy!